QLaunch is easy to use and very efficient toolbars, for launching all your favourite programs, documents, folders and websites. Clean up your desktop, get rid of all those confusing icons, put them on QLaunch toolbars instead. Increase your productivity with one-click access to ALL your programs. QLaunch comes with a diverse set of extra tools / programs: Screen Camera: that take pictures of any part of your screen. Clean Clipboard: that removes all formatting from clipboard. Magnifying Glass: magnify up to 48 times and pick colors. Print Screen Catcher catch the output from Print Screen. Sticker: write notes on a zoom able sticker. Web Image: resize, crop, sharpen and compress images for use on the web. Image To Icon: convert one or more images into an icon or into several icons. Icon to Pngs: extract individual or all images from icons. File Template: A uniform way af making file templates. Folder Menu: view a folder as a menu. File Time Changer, Alarm / egg / stop watch, Alphabetizer: organize words or lines alphabetic. Break Lines and a Minimize All Windows. QLaunch can stick to all the edges of your screen, see screenshot. Quick Launch have auto hide so you only see it when you want to. 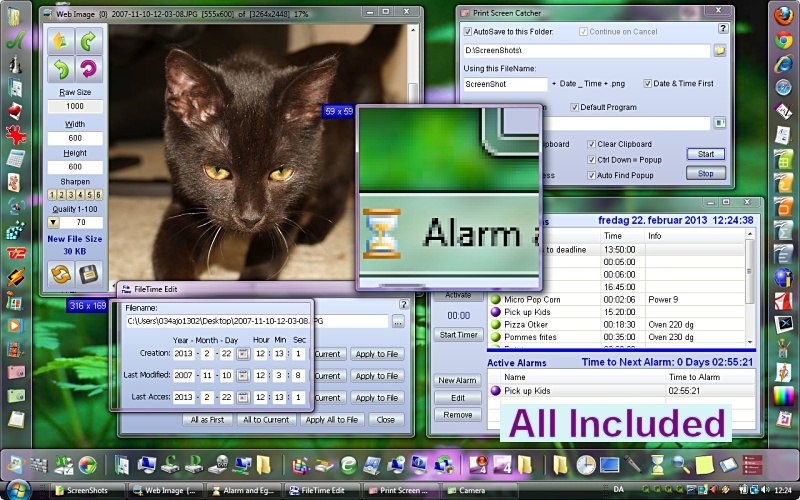 QLaunch is designed for Vista and Windows 7 with full Aero style, but it can also run on win XP. If you are the kind of person, that like to have quick access, to your programs and websites and if you like toolbars with images better then menus with text, you simply must try QLaunch. Quick Launch can stick to all the edges of your screen, there can even be three different toolbars on every edge and up to four on one screen edge, each toolbar using a different part of the screen edge for activation. You can add any program, short-cut, file or folder to QLaunch simply by drag and drop. You can even copy or move files to a folder on the toolbar in the same way you do it with a short-cut on the desktop. This site does not contain serial number, crack, keygen QLaunch / Quick Launch serial number : serial number is the simplest type of crack. A serial number(cdkey,product key,etc) is register the program as you may already know. a crack or keygen may contain harmful software. If you cannot find the exact version you want, just give it a try. for more information read .nfo/.txt/.diz file include in zipped file.